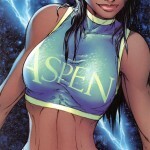 Aspen comics is finally going to get the coverage they deserve as they have signed on to have a film made from the popular comic series Fathom. The Fathom comic was first published in 1998 by Aspen comics and had huge success especially for an indie comic publisher although it did have some big names behind its creation. My guess is the film will be based on the first series and will hopefully lead on to at least one sequel to give the story arch time to develop. Fathom is a pretty awesome comic full of grade A illustrations many of which from the hand of the late Michael Turner who has worked on countless comics in his career. So far nobody has released much information about the film set for release in 2011 but we do know Megan Fox has signed to play the lead character in the film Aspen. This is the second attempt of a film adoption as a film was announced back in 2002 but nothing came of that after James Cameron signed to direct. The comic story followed a girl called Aspen who was had lost her memory and was adopted, then years later she finds she is part of an under water race of people who can control water. The comic is awesome but if this film adoption is like the Wanted movie the film could end up being a remake of The Little Mermaid so lets hope they find a good writer and director to make a film worthy of the comic franchise. With a recent status update from Aspen comics we may be one step closer to getting a Fathom movie with a 2015 release date. News on the Fathom movie staring Megan Fox has been a little slow of late probably due to Transformers 3 being pushed forward. The film is moving forward be it very slowly but will hopefully be worth the wait to see Megan Fox play Aspen.